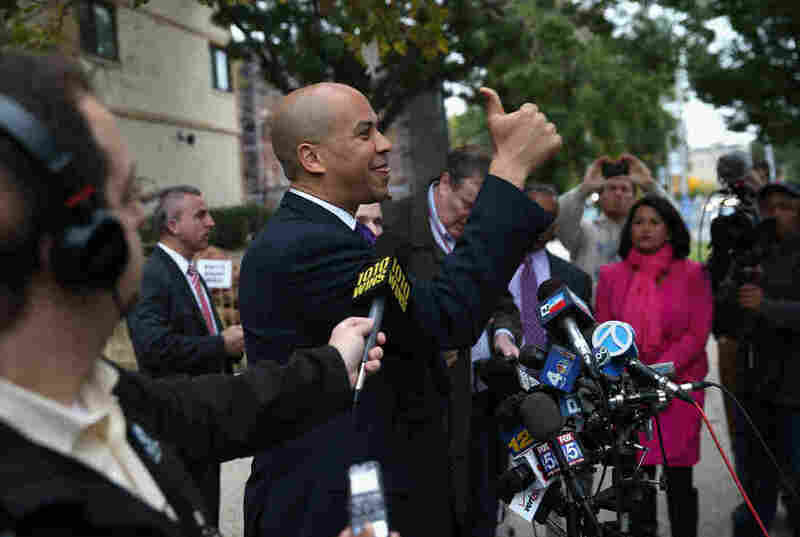 In Special Election, Cory Booker Wins N.J. Senate Seat : The Two-Way The Associated Press called the race in Booker's favor after he took a strong early lead. The Newark mayor will become the first black senator from New Jersey. Newark Mayor Cory Booker greets a supporter after casting his vote in a special U.S. Senate election on Wednesday in Newark, New Jersey. The Associated Press projects that Newark Mayor Cory Booker will win a special election for the New Jersey Senate seat left vacant after the death of Frank Lautenberg. With 55 percent of the precincts counted, Booker, a Democrat, has a commanding 11-point lead over Steven Lonegan. Booker will succeed Gov. Chris Christie's interim appointee, Republican Jeff Chiesa, and will have to run again in 2014 for a full six-year term. "Booker, 44, will become the first black senator from New Jersey and heads to Washington with an unusual political resume. He was raised in suburban Harington Park as the son of two of the first black IBM executives, and graduated from Stanford and law school at Yale with a stint in between as a Rhodes Scholar before moving to one of Newark's toughest neighborhoods with the intent of doing good. "He's been an unconventional politician, a vegetarian with a Twitter following of 1.4 million — or five times the population of the city he governs. With dwindling state funding, he has used private fundraising, including a $100 million pledge from Facebook founder Mark Zuckerberg, to run programs in Newark, a strategy that has brought his city resources and him both fame and criticism." Booker is also a rising star in the Democratic party.